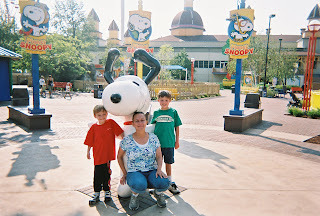 Photo: I felt like doing a "happy dance" as I posed with my two happy, well behaved boys (during the morning anyway) at Planet Snoopy, which is part of Cedar Point Amusement park in Sandusky Ohio. 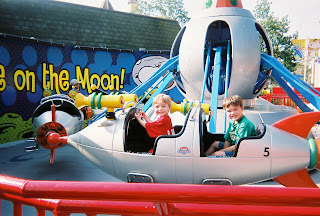 Photo: My two guys went on a lot of rides together. Both fit the height requirements for the kids' rides which worked out great because my oldest, unlike some people on the spectrum, dislikes roller coasters and most fast (scary) rides. The day went pretty well, especially in the morning when it was cooler with fewer park guests. We all became a little grumpy later in the day as it became quite warm and more crowded. However, the morning was wonderful. As part of our resort package we were allowed into the park an hour early, which was a real perk! Photo: My boys and I just before we left the park, on Lake Erie beach in front of The Breakers Hotel, which is part of Cedar Point Resorts. To see a picture of the hotel or to get more information about the resorts(s) click here. 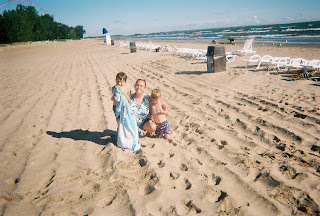 We stayed two nights and visited Cedar Point Amusement park in the day between the stays. The hotel also had two pools (one outdoor and one indoor pool) and we visited both as well as going to the beach twice. I think the boys had as much fun swimming as they did going on the rides. Real life is back in full swing. School starts up here in Michigan after Labor Day and we aren't quite ready. We'll be working on that in the next week. I'm hoping to go back to regular themes instead of posting on day-to day- life every once in awhile as I have been doing lately. I received a few requests via comment while on vacation and I hope to address those soon in upcoming posts. In the meantime, my boys (especially the one on the autism spectrum) have to get used to the idea that we can't do something fabulous and fun every single day! Well that was an issue the first weekday after returning from vacation. I caught my older one downloading a map to this zoo which is an hour-and-a-half away! However, today was peaceful and without too difficult to meet demands. Hopefully, we can get away with a few quiet days at home this week. Oooh... you have guts taking the boys to Cedar Point! I'm not quite "there" yet! Great pics- looks like everyone had a blast!